We’ve just been to Taranaki to join the Pakeha Hikoi for Peace– a walk from New Plymouth to Parihaka in support of Mayor Andrew Judd’s campaign for Maori representation on New Plymouth District Council. The council’s proposal to include one Maori ward for the next Council election was defeated last year by a Citizen’s Referendum. As a result of the hate-mail and abuse he has experienced during the campaign for a Maori ward, Andrew has been urging all Taranaki people, indeed, all New Zealanders, to engage in new conversations about Maori-Pakeha relationships. So a group of Pakeha and Maori supporters organised the Hikoi for Peace. On the first day, Wednesday 15 June, a group walked from the New Plymouth Council Chambers to Oakura, where a two-hour discussion was held. On the second day, the walkers went from Oakura to Okato. 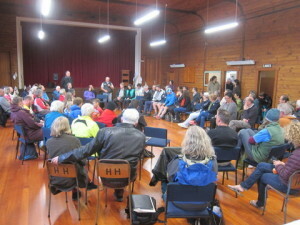 We joined the conversation in the Okato Settlers Hall, where more than a hundred people gathered after completing two days of walking and talking from New Plymouth. For two hours, in small groups, we all shared our reasons for joining the hikoi, possible ways for achieving strong representation of Maori on the New Plymouth District Council, and other concerns about Maori-Pakeha relations and Pakeha responsibilities. 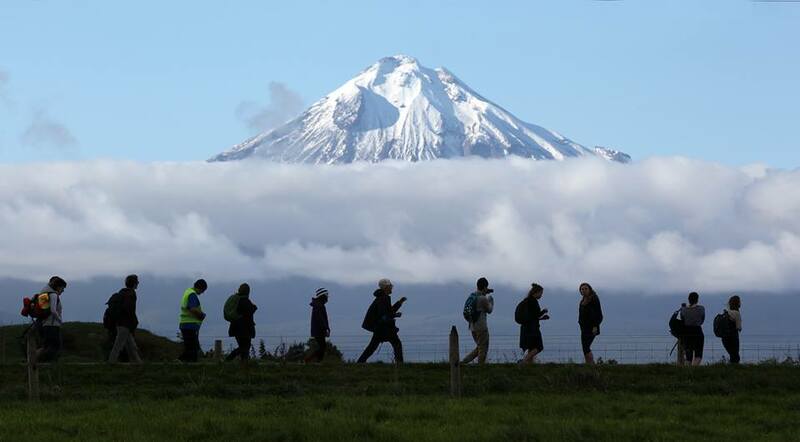 The next morning, Friday 18 June, we all set off on a 22km walk from Okato to Parihaka. Why Parihaka? If you don’t know what happened at Parihaka on 5 November 1881, and the years before and after, see the notes and resources at the end of this column; Parihaka is one of the worst examples of colonial oppression in our country’s history, and has become a symbol of non-violent resistance, and therefore of the search for peace and justice, in Aotearoa and world-wide. The walk to Parihaka was seen as a walk of commitment to justice, and to peace, and we were all committed to walking peacefully, without banners, or slogans, or shouting, or retaliation to any abuse. An older man said his 13-year-old daughter had been expressing her pain and horror about the bad things happening in the world; she said she didn’t want to grow up to live in a world like this. So when he heard about the hikoi, he decided to bring her with him to see that there were good people, who cared, and who wanted to make the world better- and that she could help to change the world too. A young woman who had been an exchange student from her prestigious school in New Plymouth to a school in Denmark had realised when she was away that her schooling had taught her nothing about New Zealand history. She was deeply angry about this failure, and went to a different school, with a strong Maori presence, when she returned. One young man from a Catholic boys’ college in New Plymouth had been taught quite a bit about the history of New Zealand at school including about the Treaty of Waitangi, but had left school with the belief that most claims were settled now and the problems of the past had been resolved. Now a third-year university student in history and politics at Victoria University, he knows differently. A local Pakeha dairy farmer had been brought up in a small Taranaki settlement alongside Maori whanau, and now is trying to support his children’s school in their attempt to build a wharenui at the school. He is trying to encourage some of his fellow Board members to consider the consultation process with local Maori in a positive way, so he felt moved to join the hikoi to show his support for Andrew Judd’s stand. Many people, of all ages, commented that growing up in New Zealand they had never learnt about what happened at Parihaka, or indeed anything at all about the Land Wars and the attempts to assimilate (or exterminate) Maori in Taranaki. Their schooling left them totally ignorant, and now feeling angry about the continuing neglect of New Zealand history in the curriculum of most schools. By the time we arrived at Parihaka, the numbers on the hikoi had swelled to almost a thousand. We were welcomed into the village and led to Te Marae o Toroānui, all the way to the sound of karanga, greeting and grieving, from many kuia, both hosts and guests. 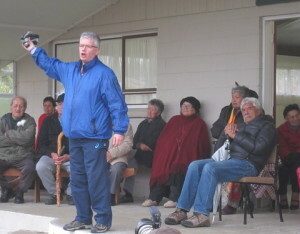 After the exchange of whaikorero among the kaumatua on both sides, Andrew Judd was invited to speak. He talked briefly about his own ignorance until very recently, his determination to go on working for change, and his intention not to seek re-election as mayor because of the violence of opposition and the way his presence would polarise the election. 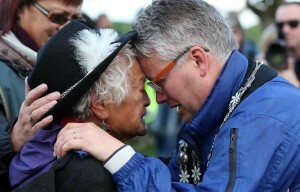 He took off his mayoral chain, and holding it up, declared, that no-one should wear this chain again unless committed to justice for Maori in Taranaki. A kuia took the chain in her hands and blessed it with a prayer. And finally, the people of Parihaka, assisted by some Pakeha locals, served hot soup and rolls and home baking for the crowd of almost a thousand in the whare kai, Te Rānui. Of course, one of the main talking points during the walk has been follow-up action on the issues raised about Maori-Pakeha relationship in New Plymouth – and beyond- during the last few months . 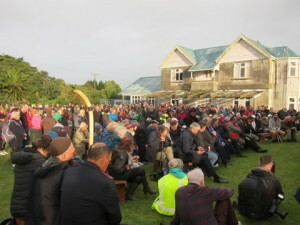 • One suggestion that has been put forward by many supporters is that all people allowing their nominations to go forward for Councils in the Local Body elections (and actually for Parliamentary elections too) should be invited to participate in locally organised workshops on the history – Maori as well as Pakeha – of the area they wish to represent. Also, that all should have to ensure they are capable of pronouncing Maori personal and place names properly, at the very least. 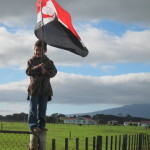 • Another strong recommendation is that pressure be put on the Ministry of Education to require schools to include coverage of New Zealand history in the New Zealand Curriculum, and to ensure that resources available to schools include Maori as well as Pakeha perspectives. • A third is that the Local Body legislation be amended to make participation by tangata whenua in decision-making obligatory, not just “consultation” which can be ignored. • A fourth idea is that all those who participated in the hikoi should have conversations about these matters with another half-dozen people- family, friends or workmates- and that they in turn continue the process, perhaps. In Taranaki, in 1881, settlers began to move onto productive, cultivated Maori land around the village of Parihaka. Every day new fences were put up on their land by surveyors, and road works begun – every evening men from Parihaka pulled out the fences and dug up the roads. This peaceful (and entirely reasonable) resistance – the settlers had no legal right to take the land –angered the government, and John Bryce, Minister of Police, came with a force of around 2000 British and colonial soldiers and camped above Parihaka Pa with canons trained on the village. On 5 November 1881 the force marched up to the gates of the Pa, where they were greeted by children dancing and women offering loaves of bread. Pushing past, they found all the men of the village sitting peacefully, without weapons, on the ground. Under the leadership of two prophets of the Pai Marire faith, Te Whiti o Rongomai and Tohu Kakahi, this village had become a settlement for many hundreds of Maori refugees from other areas where their land had been seized and their people were starving. All in the village were committed to finding peaceful ways to resolve conflict. Soldiers arrested the two prophets, and dragged away the other men; all were imprisoned without trial. On subsequent days, during their occupation, they raped women, looted treasures, and burnt houses, without any violence in return. Some soldiers had the grace to be appalled at the actions of their own troops, and defected. 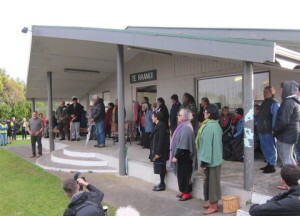 When word got out, many Pakehas outside Taranaki protested at the brutality and injustice of the invasion of Parihaka. Later, the village was rebuilt to a high standard, with streetlights, water and sewage. But no land was returned, and the only employment open to Parihaka people was poorly paid casual labour on farms and in factories. Since then, Parihaka has become a symbol of peaceful resistance in the face of provocation, injustice and war. People have come from all around the world to honour their courage and reflect on the ways of peace. for the terrible losses experienced by this tribe. How wonderful! Another very good book is Te Whiti o Rongongomai and the reisitance of Parihaka by Danny Keenan, Huia , 2015. Danny had interviewed Rangikotuko and other descendents of Te Whiti and is himself related I think. It’s a scholarly, well informed and extremely readable book. Well done you two – this sounds like an excellent and very worthy protest. Apart from that, walking 22km in a day is not easy. A very good test for knees and hips! What a great write-up. Thank you so much. I wasn’t able to be there in person but my heart was with the march all the way. I know that part of Taranaki so well from my many visits to my dear teacher in Pungarehu. I love the stories you collected, and that you walked separately so you could interact with the other marchers.